The fourth episode of The Five Point Move Podcast, presented by Mat Talk Online, features two-time World Team member and two-time US Senior National Champion Cheney Haight (80 kg, NYAC). Haight has remained one of the most durable, consistent, and respected athletes in the country ever since his arrival in full back when he was a student at Northern Michigan University and training under legendary coach Ivan Ivanov. As an athlete, the 32-year-old of Orem, Utah is known for his eagerness to bring pressure and a positively deadly arm throw that he can hit from just about anywhere. In addition to his actual on-the-mat abilities, Haight is a humble, understated gentleman who carries himself like a true professional (hence, why we had to have him as a guest). Last month in Las Vegas, Haight captured that second World Team spot by defeating rugged vet and former Trials finalist Courtney Myers (Army/WCAP) in the semifinals before getting by emerging Marine John Stefanowicz in two straight to cap that series. 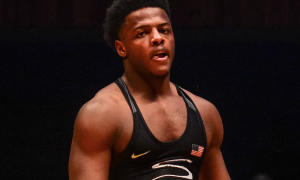 A week later in Brazil, the Olympic Training Center resident kept the ball rolling with two technical fall victories to notch his second consecutive gold at the Pan Am Championships. From here on out for Cheney, it will first be the prestigious Tbilisi Grand Prix in Georgia, a camp in Hungary, and then the final push to the 2017 World Championships in Paris. We talk to Haight and discuss his recent wins in Vegas and Brazil, and also touch on various aspects of his career and training. 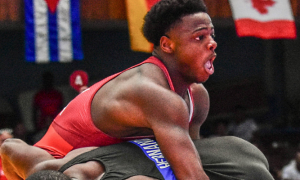 In addition, co-hosts Tim Hands of Five Point Move and World Champion Dennis Hall get into Greco-Roman’s exclusion from the annual Beat the Streets event, the notion of setting up domestic duals, and some other fun stuff.